I love dad and all the issues that have followed. Whatever your daddy issues are, whether stemming from your need or desire for his approval, or his lack of needing yours, our only option is to move forward as best we are able. 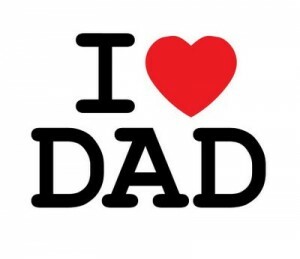 I don’t know if you have a good dad, bad dad, step-dad, old dad, young dad, absentee dad, abusive dad, proud dad, supportive dad, adopted dad, gay dad, whatever your situation and relationship is, you probably are going to want to be a great dad yourself or have a partner who is someday. I’d like to express my gratitude to the great dad’s of the future and thanks for doing your best even when you’re three sheets to the wind at a tailgate party and your face paint is melting. Cheers!